Gina Welborn - be light. be love. believe. Until then, I'd been using the tagline, Prairie Stories to Stir Your Heart, but one of the Inkies came up with Woven Under Western Skies. I liked it right away, but felt it needed more. I mean, what was woven under the western skies? 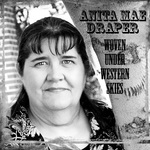 All my books contain faith and romance as well as being western based. 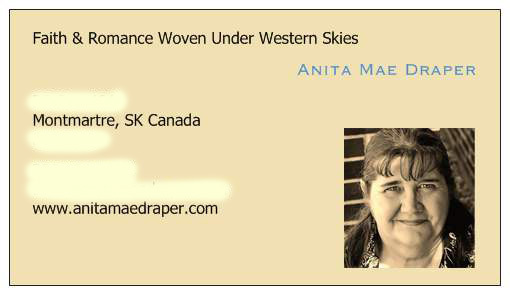 So my tagline became Faith and Romance Woven Under Western Skies or just Woven Under Western Skies when space is at a premium. I had the words, but I wanted a logo to match. So I started playing around aiming for simplicity. 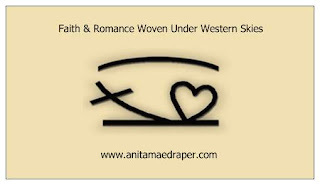 #1 - I liked the flowing look which simulates the prairie wind and the curved line for Under the Western Skies, as well as the faith element, but what about the romance? 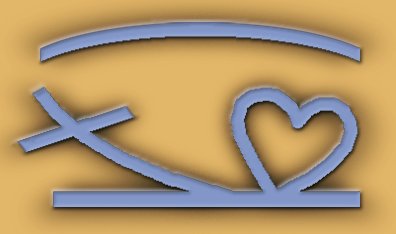 #2 - I liked the idea of the cross and heart entwined, but it didn't look right even though I tried to slant the cross and heart to simulate the windy prairie. #3 - Uh oh. I'd gone backwards in my design. By trying to show the woven part, I lost the romance. And the overall look was too busy. #4 - Okay, this I liked. Similar to #2, but better because the cross and heart are going in opposite directions. Not only does that balance it out, but it simulates two people from diffferent faiths, backgrounds, and walks of life. Plus, I still had it all Under the Western Skies. Perfect! Well, not quite. The image was what I wanted, but it looked childish. I needed an artist to pull it all together and make it shine. As it happens, God has blessed me with a friend who is a graphic artist when she's not writing or mothering. I suppose she's really an eFriend because I've never met her, but firmly believe God had a hand in bringing us together back in 2005 when I used to participate in the Writing Challenges on the Harlequin Community Forum. Other than her exceptional writing, DebH drew my attention with her avatar. 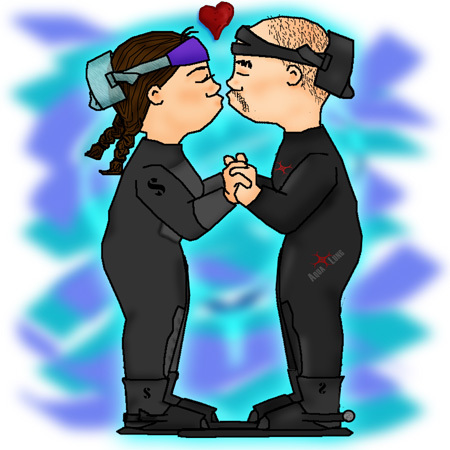 It turned out to be the image she created for her wedding invitations showing her and her fiance doing what they love doing most - scuba diving and kissing. Heh. 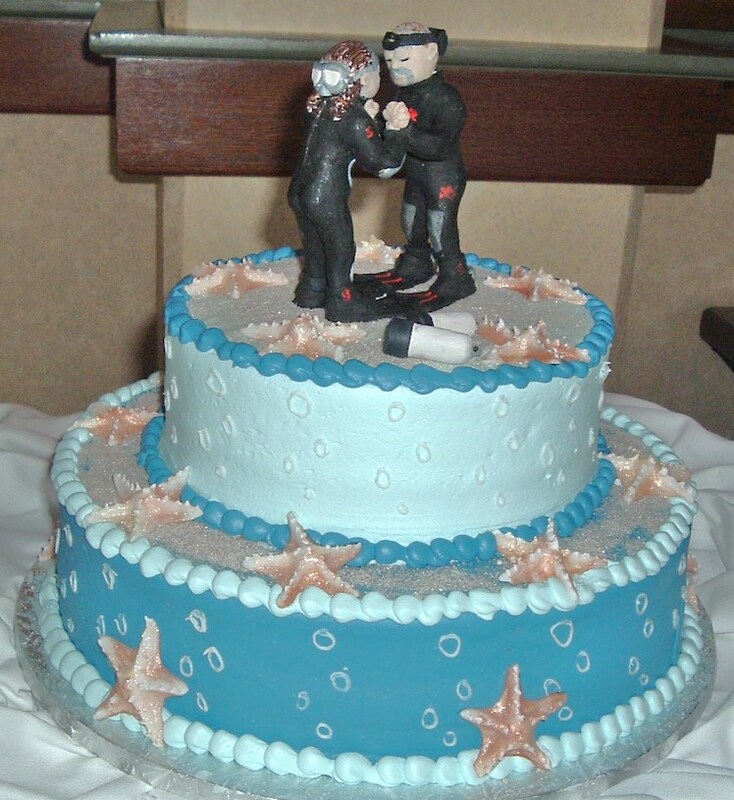 Deb took it one step further and used the same images to create the topper for her own wedding cake. 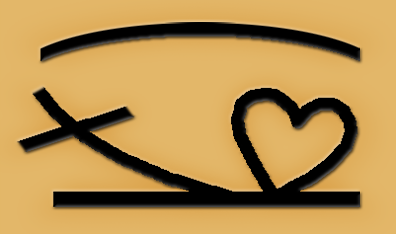 Naturally, when I needed help with my logo, I emailed it to Deb with the word, HELP! Within hours, Deb sent me a reply that said, It sort of looks like you were going for a brand looking type of logo. (like a cattle brand?) Going with that line of thought, i liked logo number four - it seems more aesthetically balanced. i'm attaching a photoshop file with my interpretation of that "brand". you can turn on/off different layers to see how it looks (i put a tan background for you to see the brand "burn" i added for a subtle touch - you can turn off those layers though). i even put in a blue the same color as your name on the vista card (nice! like the sepia too). Not only has Deb been there to help me artistically, but she's followed my writing progress and is one of my biggest fans. I can't tell you how honored I am that someone like Deb believes in my writing ability. Here's Deb with her son, Nathaniel aka Guppy. 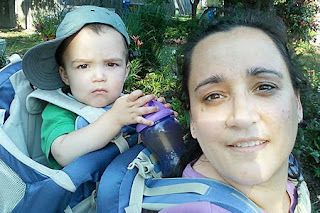 Yes, she's the DebH that comments on my blogs, including here at the Inkwell where either one of us will mention Guppy, her son and Boats, her husband. Guppy is quite a suitable nickname when you look at his scuba diving parents. Oh, and did I mention that Deb got married on a dive boat at sea? Thank you, Deb for supporting me all these years and being there when I needed you. Hugs. Do you have a brand? Tagline? Icon? Tell us about it. And if you don't, tell us what you write and maybe we can help you create one. Check my new website for rules on how you can enter my Welcome Prize Package. Anita, I love your creative process, and 'm so glad you shares how you came up with your icon. And DebH... wow, I love what she did with your vision, Anita. It's wonderful. Well word on the street is you will probably sell soon so it's good you are doing all this prep now ! Looks great and thanks for the scoop on DebH. Suzie, I've often thought of myself as an artist, but what I see in my head doesn't look the same on canvas. It's just one of the reasons I admire DebH - she can translate her thoughts onto paper whether it's images or words. Oh Deb, I wish you were my agent! Since you're one of my crit partners, I can only hope you know what you're talking about. But then you've always supported me, too. I am continually amazed by the friends and supporters God has blessed me with. How can I not try my best? Such a cute logo with a great tagline! Love the literal "brand" and the Western look of your new website. In addition to the simple brand - Dance with Passion, I also have a longer version I use. "Dina Sleiman writes lyrical stories that dance with light. Join her as she explores the unforced rhythms of grace." I never thought of any sort of logo or icon, but after I can up with "Dance with Passion" I had my husband take hundreds of pictures of me dancing on the beach for use on my website. You know you have the right tag line when it just pops like that. Love your logo too, Anita. Thanks, Anne. I spent months thinking of the perfect one to define me and my writing. Yes, I used my original Prairie tagline, but when I realized people associated Prairie books more with the frontier stories than the actual location, I knew I needed a change. Dina, as I read your comment, I imagined your pose as a line drawing. A few strokes of flowing lines simulating your dance pose. That what I see for your logo. The cover of your debut book, Dance of the Dandelion shows your graceful daughter in a similar, but more refined pose which would also work as a logo. First, your ideas for a logo were great and I love what you finally came up with. And Deb did a fabulous job refining what you had. i'm not even close to the publishing stage as you are and since God has given me an artistic gift, i look for ways i can plant my skills as seed for reaping a harvest later (like being pubbed myself...someday). investing in the Kingdom is always fruitful anyway. Your boldness of Faith, Anita, has been a great inspiration to me - it was a joy to be of help. And thanks to all the ladies who think Guppy is adorable. I think so too, but then, I'm biased. *heh* He's definitely our little gift from God. LOL DeAnna, call the Inkies together and we'll help you find one. Deb, you're sweet to offer to help. Your comment reminded me of that first year at eHarl went we didn't know each other to be believers. The writing challenges are mainstream writing so we didn't profess our faith in our normal day-to-day conversations or writing. Considering the challenges have to be under 1000 words and need to incorporate the challenge theme, it's hard to add anything other than what is required. And then about a year after we met, Deb emailed and asked a very tentative, "Are you a believer?" Well yes, I am. And I'm so glad she had the courage to ask. Thanks, Anita. Yes, I'd love to brainstorm with everybody about a logo that goes with my "Step into time . . ." tag line. And I meant to mention how very cute Guppy is. He looks like he's about to tell the paprazzi to get out of his face. He's darling! Anita, coming from the land of cattle brands myself, I absolutely love this! Kudos to you and DebH! That's so impressive, Anita!! You've got me thinking. I never considered a logo before. I've been using Writing Faithful Romances as my tag. Earlier I used Faithful Romances worth pondering, but thought was a little iffy. I can't figure out how to expand it to claim the questioning I hope my stories creates in the readers mind--a desire to consider if they need to change their views on something? One day hopefully something will come to mind. Dina, I just realized I said line drawing which I think means the outline. Right Deb? i knew just what you meant when you said line drawing. i think line drawing works better for what you're thinking of than an outline, especially if you want to capture the "movement" of the picture. I never thought of creating a logo, either, but it's a fabulous idea! It really pops out on your new website, too. The process of how your logo unfolded is fun. Guppy is adorable. I liked the wedding cake, too! Nice to meet you, Deb! Looks great! I like it! Is there anything unique about you or your past that explains why you write what you do? - VistaPrint has dozens of logo samples which was where I decided I wanted one too. It's like writing... you never know what will spark an idea. I'd like to know if you came up with anything, so keep us informed and I'll keep thinking about it too. PS I'm using my iPhone and it won't let me see the top of this comment so please excuse typos. DebH, I bet we're thinking the same. I wonder what Dina thinks, though? Susie, yours would probably show a teacup with a touch of lace, 19th century style. Or a scalloped hanky with a bit of embroidery as the background and then a teacup in the foreground. Well, the day we just happened to be available to chat on line about tag lines was an awesome day. We done good! Now for logos? Wow, that's a lot to think about. I think I should just FINISH THE EDITS first. Anita, thanks so much for your suggestions. I have to mull over this. Lots of mulling. Like the logo! Looks great! I love how your brand is an actual brand. Shouts western all on its own. Quite cool.